TurboCharged is marketed as a rapid fat loss diet written by sister and brother, Dian Griesel, Ph.D. and Tom Griesel who have been involved in research into health, exercise longevity and stress management for the last thirty years. They are both in their fifties, but say they can prove they are leaner, stronger and have the metabolism of teenagers due to the program they share in this book. The authors claim that you can lose 2% or more body fat per week, which equates to 2-7 pounds, depending on how strictly you follow their fat loss diet and how much weight you have to lose. Furthermore this plan requires no strenuous exercise or nutritional supplements but instead works by training your body to use excess body fat as a source of energy. This is achieved by practicing what they call “enlightened fasting” whereby the body is starved of foods that trigger a high release of insulin. This includes sugars, processed foods and grains, including whole grains. You have two choices when commencing this rapid fat loss diet: Expressway or Superhighway with the major difference between them being the amount of calories allowed. With the Expressway calories are unlimited but you must only consume specific foods. The Superhighway requires restricting calorie intake to a maximum of 800 per day while consuming highly nutritious foods. Every four to five days you can have a higher calorie day because this helps to boost metabolism. An important principle of the rapid fat loss diet involves food combining where dieters choose either a protein meal or a carbohydrate meal (consisting of fruits and/or vegetables) without mixing them. Meals consist primarily of fresh fruits, salads and lean protein and ideally you will eat only one type of food at a time. Once you have reached your goal weight you then move into the Cruise Control phase where you can include nuts and beans in your meal plan. Drinking a lot of water is emphasized because this plays an essential role in triggering the release of hormones that give your brain the signal that you are full and satisfied. For this reason fresh fruits and vegetables are also highlighted because they are high in water and provide vitamins, minerals, fiber and natural sugars. Water, leafy greens, tomatoes, peppers, cabbage, carrots, squash, sweet potatoes, apples, plums, berries, melon, poultry, eggs, seafood, lean meat, tofu, cheese, avocado, olive oil, raw nuts and seeds (eat sparingly). Long or strenuous exercise is not required to lose body fat and can actually be counterproductive when calories are significantly reduced. For this reason dieters are encouraged instead to emphasize daily physical activities such as walking, housework and gardening. Additionally you should do three to five minutes of daily muscle power routines and examples of suitable exercises are provided in the rapid fat loss diet. These short bursts of muscular activity trigger fat burning while keeping your muscles strong and healthy. 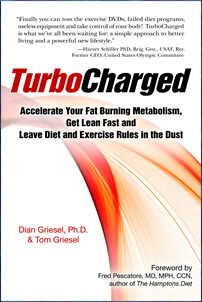 TurboCharged: Accelerate Your Fat-Burning Metabolism retails at $24.95. Encourages a high intake of fruits, vegetables, healthy fats and lean protein. Emphasizes improving body fat percentage rather than simply losing weight. Results are likely to occur very quickly. This rapid fat loss diet dispels many of the common myths about dieting and fat loss. Educates dieters how to track measurements of fat loss, which can reinforce motivation. May assist with the management of high blood pressure, diabetes, allergies, joint pains and depression. Encourages a lifestyle approach to weight management. Very restrictive and requires elimination of many foods including whole grains. Encourages extremely low calorie intakes that are generally considered unhealthy by most nutritionists. Does not provide adequate nutritional guidance for vegetarians who wish to follow this plan. Rebound weight loss is likely if normal eating is resumed. This rapid fat loss diet does not provide meal plans or recipes. TurboCharged is a rapid fat loss diet that incorporates the principles of food combining in conjunction with a very low calorie diet. It will appeal to highly motivated dieters who want fast results and prefer not to follow a structured meal plan.